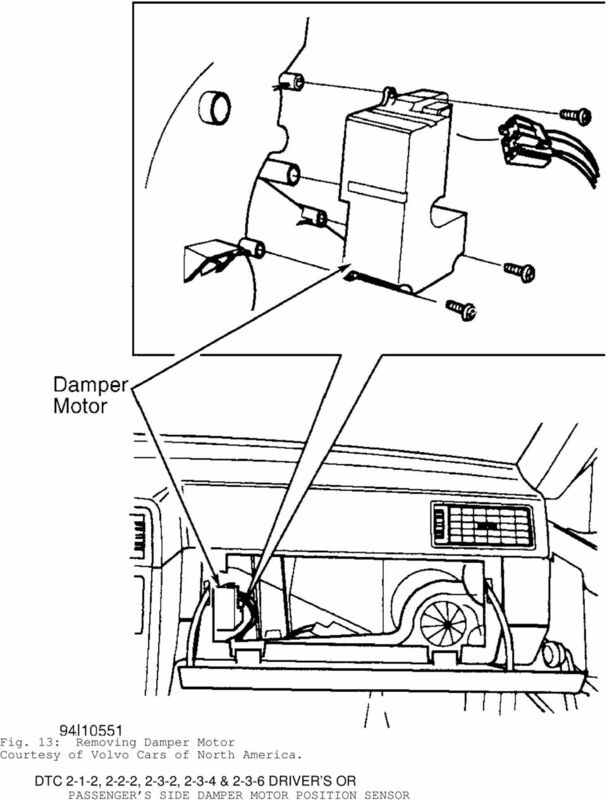 Download "A/C-HEATER SYSTEM - AUTOMATIC"
1 A/C-HEATER SYSTEM - AUTOMATIC 1995 Volvo Auto. 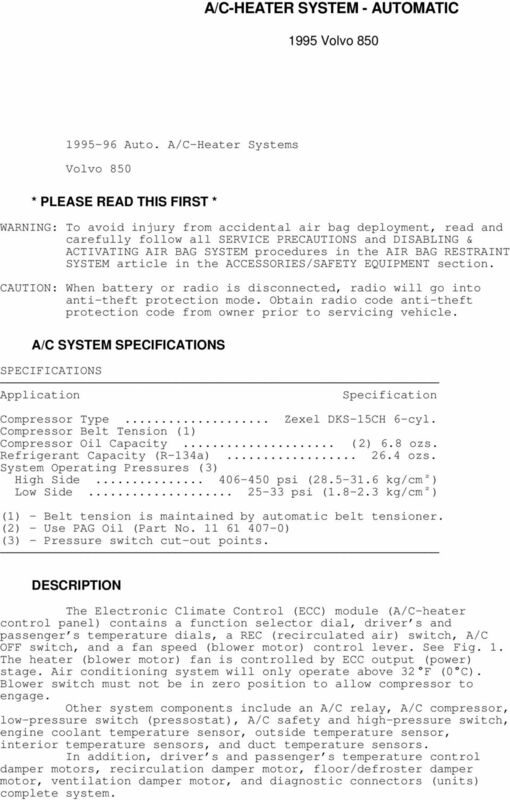 A/C-Heater Systems Volvo 850 * PLEASE READ THIS FIRST * WARNING: To avoid injury from accidental air bag deployment, read and carefully follow all SERVICE PRECAUTIONS and DISABLING & ACTIVATING AIR BAG SYSTEM procedures in the AIR BAG RESTRAINT SYSTEM article in the ACCESSORIES/SAFETY EQUIPMENT section. CAUTION: When battery or radio is disconnected, radio will go into anti-theft protection mode. Obtain radio code anti-theft protection code from owner prior to servicing vehicle. 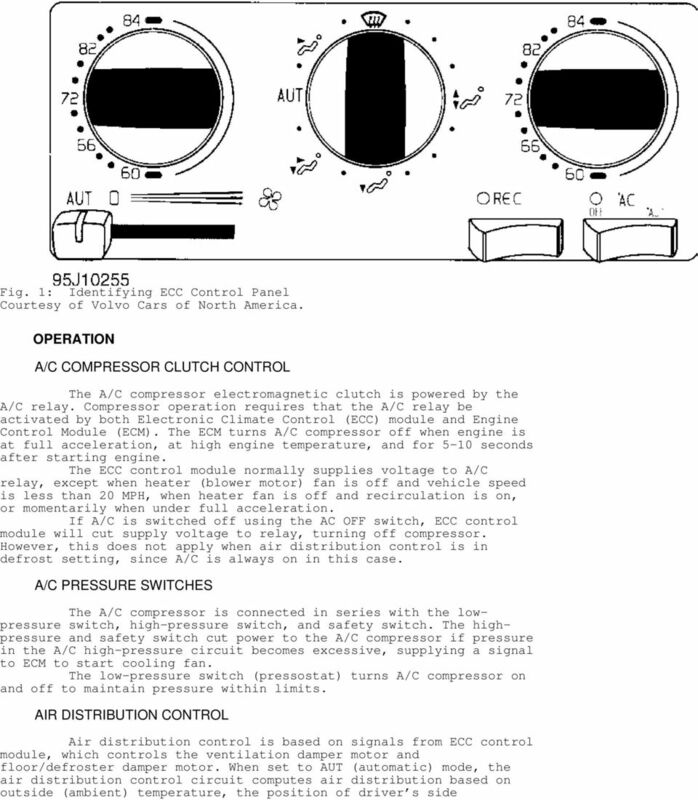 A/C SYSTEM SPECIFICATIONS SPECIFICATIONS Application Specification Compressor Type... Zexel DKS-15CH 6-cyl. Compressor Belt Tension (1) Compressor Oil Capacity... (2) 6.8 ozs. Refrigerant Capacity (R-134a) ozs. System Operating Pressures (3) High Side psi ( kg/cm ) Low Side psi ( kg/cm ) (1) - Belt tension is maintained by automatic belt tensioner. (2) - Use PAG Oil (Part No ) (3) - Pressure switch cut-out points. 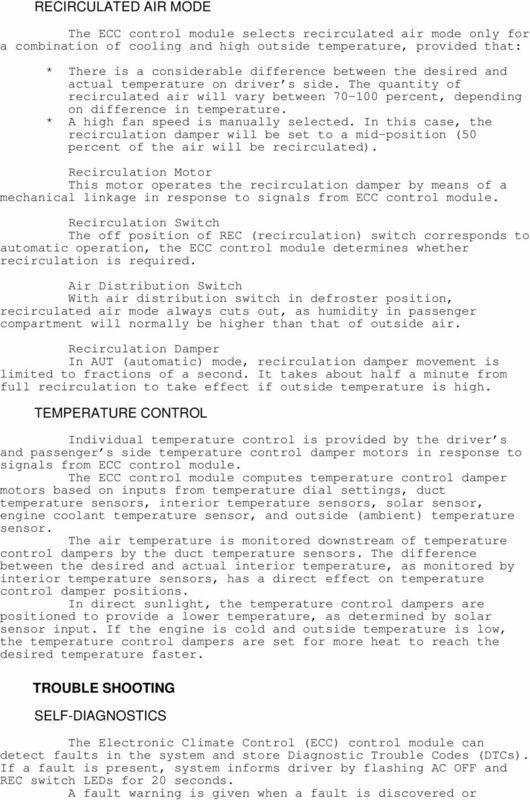 DESCRIPTION The Electronic Climate Control (ECC) module (A/C-heater control panel) contains a function selector dial, driver s and passenger s temperature dials, a REC (recirculated air) switch, A/C OFF switch, and a fan speed (blower motor) control lever. See Fig. 1. 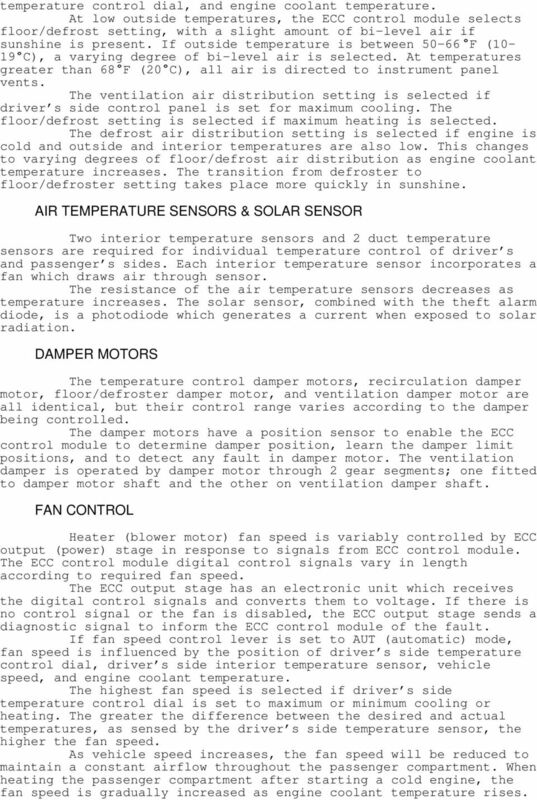 The heater (blower motor) fan is controlled by ECC output (power) stage. Air conditioning system will only operate above 32 F (0 C). Blower switch must not be in zero position to allow compressor to engage. Other system components include an A/C relay, A/C compressor, low-pressure switch (pressostat), A/C safety and high-pressure switch, engine coolant temperature sensor, outside temperature sensor, interior temperature sensors, and duct temperature sensors. In addition, driver s and passenger s temperature control damper motors, recirculation damper motor, floor/defroster damper motor, ventilation damper motor, and diagnostic connectors (units) complete system. 3 temperature control dial, and engine coolant temperature. At low outside temperatures, the ECC control module selects floor/defrost setting, with a slight amount of bi-level air if sunshine is present. If outside temperature is between F (10-19 C), a varying degree of bi-level air is selected. At temperatures greater than 68 F (20 C), all air is directed to instrument panel vents. The ventilation air distribution setting is selected if driver s side control panel is set for maximum cooling. The floor/defrost setting is selected if maximum heating is selected. The defrost air distribution setting is selected if engine is cold and outside and interior temperatures are also low. This changes to varying degrees of floor/defrost air distribution as engine coolant temperature increases. The transition from defroster to floor/defroster setting takes place more quickly in sunshine. AIR TEMPERATURE SENSORS & SOLAR SENSOR Two interior temperature sensors and 2 duct temperature sensors are required for individual temperature control of driver s and passenger s sides. Each interior temperature sensor incorporates a fan which draws air through sensor. The resistance of the air temperature sensors decreases as temperature increases. The solar sensor, combined with the theft alarm diode, is a photodiode which generates a current when exposed to solar radiation. DAMPER MOTORS The temperature control damper motors, recirculation damper motor, floor/defroster damper motor, and ventilation damper motor are all identical, but their control range varies according to the damper being controlled. The damper motors have a position sensor to enable the ECC control module to determine damper position, learn the damper limit positions, and to detect any fault in damper motor. The ventilation damper is operated by damper motor through 2 gear segments; one fitted to damper motor shaft and the other on ventilation damper shaft. FAN CONTROL Heater (blower motor) fan speed is variably controlled by ECC output (power) stage in response to signals from ECC control module. The ECC control module digital control signals vary in length according to required fan speed. The ECC output stage has an electronic unit which receives the digital control signals and converts them to voltage. If there is no control signal or the fan is disabled, the ECC output stage sends a diagnostic signal to inform the ECC control module of the fault. If fan speed control lever is set to AUT (automatic) mode, fan speed is influenced by the position of driver s side temperature control dial, driver s side interior temperature sensor, vehicle speed, and engine coolant temperature. The highest fan speed is selected if driver s side temperature control dial is set to maximum or minimum cooling or heating. The greater the difference between the desired and actual temperatures, as sensed by the driver s side temperature sensor, the higher the fan speed. As vehicle speed increases, the fan speed will be reduced to maintain a constant airflow throughout the passenger compartment. When heating the passenger compartment after starting a cold engine, the fan speed is gradually increased as engine coolant temperature rises. 13 ground wire. If only DTC or is present, go to next step. 2) Turn ignition off. 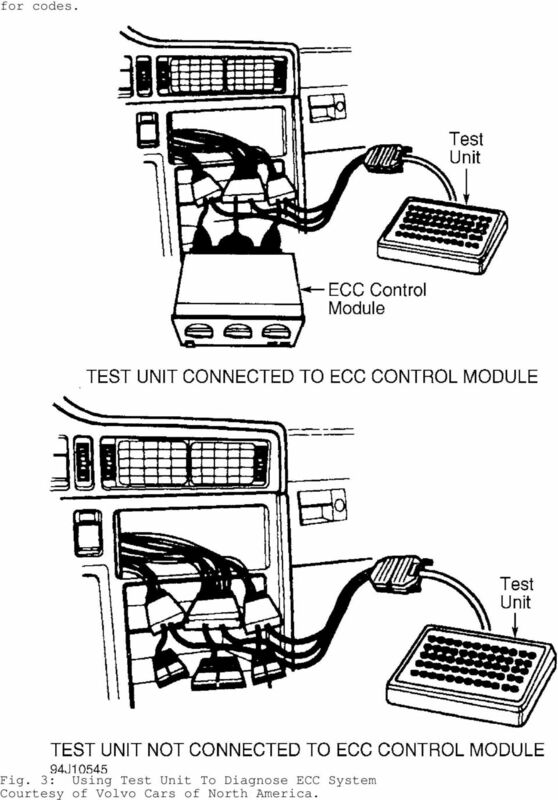 Install test unit and adapter between ECC control module and wiring harness. Turn ignition on. Connect voltmeter to test unit pins No. 10 and 12 to check driver s side temperature sensor and terminals No. 10 and 13 to check right side temperature sensor. 3) Voltage should be about 2.6 volts at 68 F (20 C). If voltage reading is 5 volts, check for open circuit in passenger s side temperature sensor then go to next step. 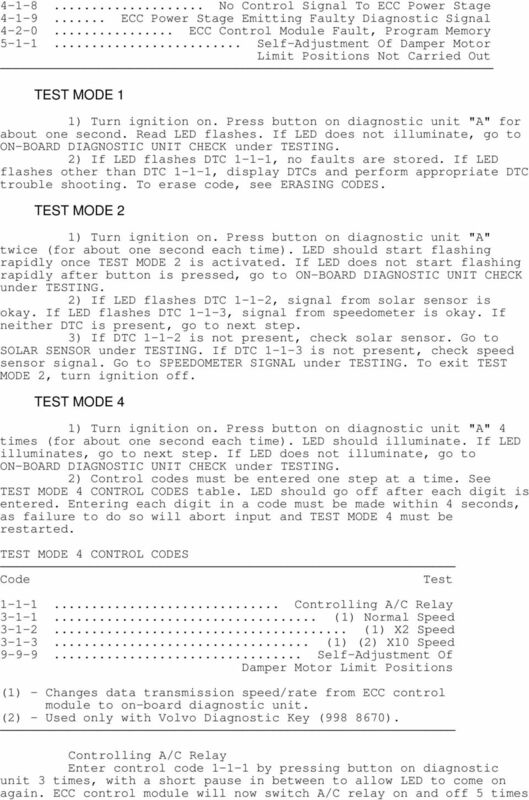 If voltage reading is 12 volts, repair short circuit between sensor harness terminal No. 5 (Green or Yellow wire) and ECC control module. 4) Turn ignition off. 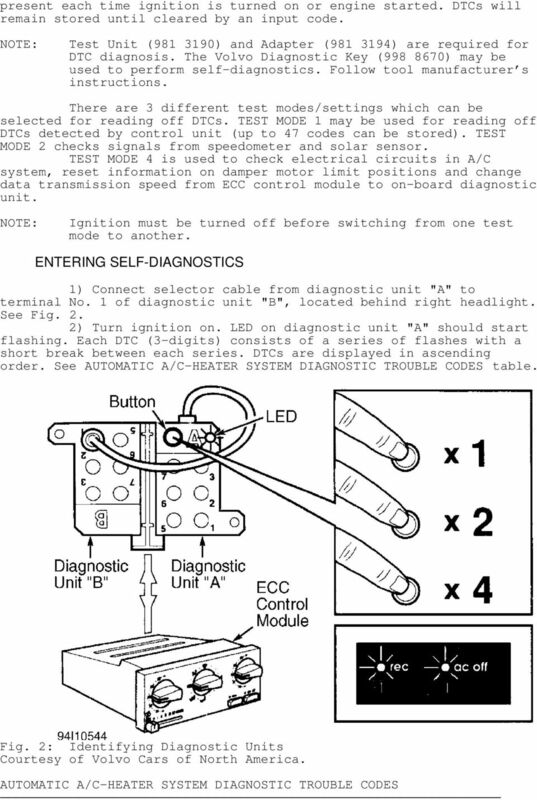 Disconnect Adapter ( ) from ECC control module. Disconnect temperature sensor connector. Install jumper wire between sensor harness terminals No. 3 (Brown wire) and No. 5 (Green or Yellow wire). 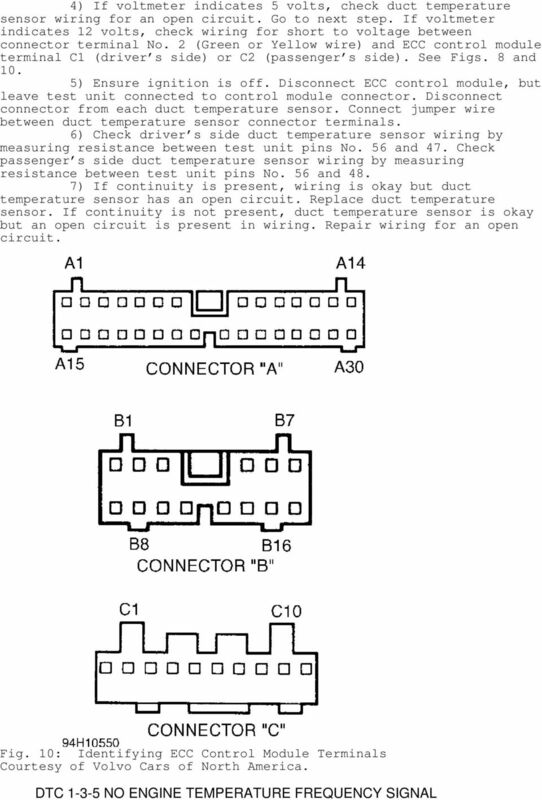 5) Connect ohmmeter between test unit pins No. 10 and 12 for driver s side temperature sensor or pins No. 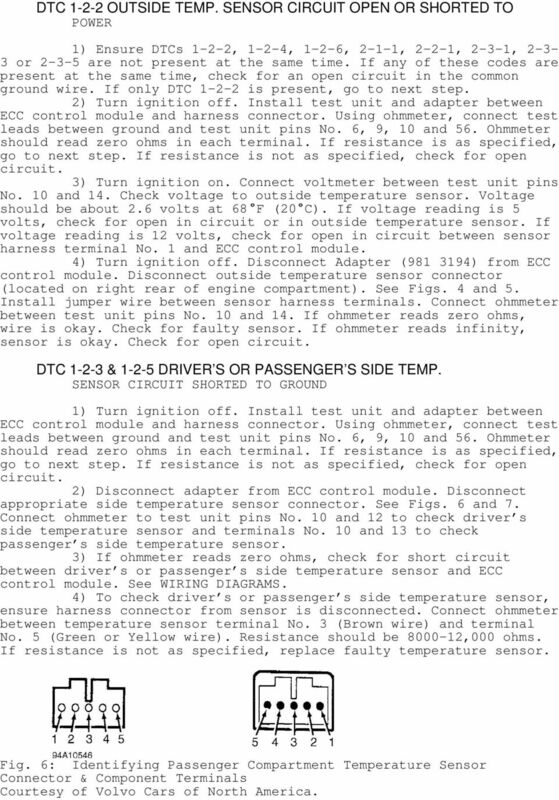 10 and 13 for passenger s side temperature sensor. If ohmmeter reads zero ohms, wire is okay. Check for faulty sensor. If ohmmeter reads infinity, sensor is okay. Check for open circuit. 6) To check sensor resistance, disconnect sensor harness connector. Connect ohmmeter between sensor terminals No. 3 (Brown wire) and No. 5 (Green or Yellow wire). Resistance should be , 000 ohms. If resistance is not as specified, replace faulty sensor. Clear and recheck for DTC. DTC & DRIVER S OR PASSENGER S SIDE DUCT TEMP. SENSOR CIRCUIT SHORTED TO GROUND 1) Ensure ignition is off. Connect test unit to ECC control module. Check ground circuits and repair as necessary. 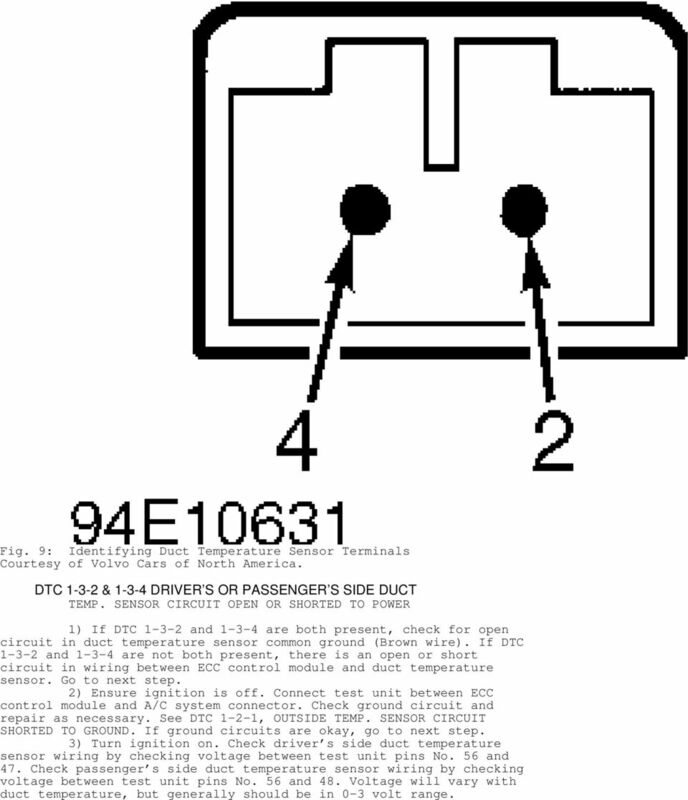 See DTC 1-2-1, OUTSIDE TEMP. SENSOR CIRCUIT SHORTED TO GROUND. If ground circuits are okay, go to next step. 2) Ensure ignition is off. Disconnect A/C control unit, but leave test unit connected to A/C control unit connector. Disconnect driver s and passenger s side duct temperature sensor connectors. See Fig. 8. 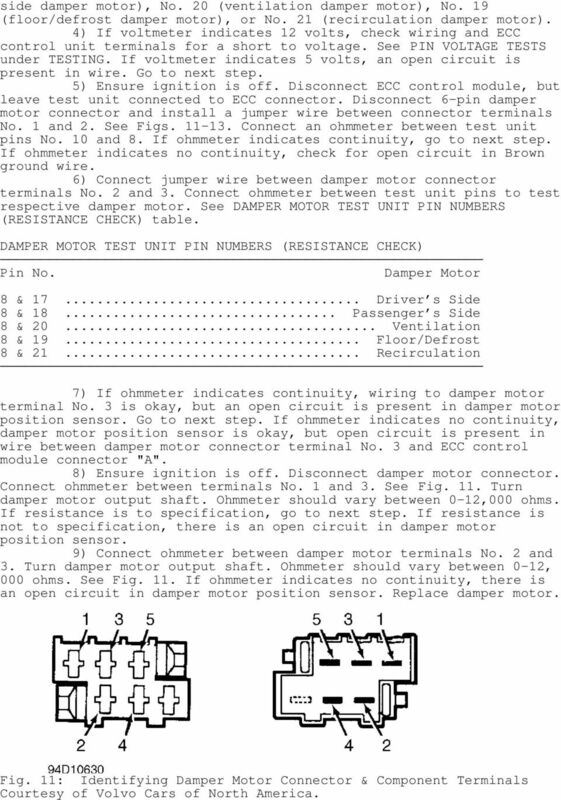 3) Check wiring resistance for driver s side duct temperature sensor by measuring between test unit pins No. 56 and 47. 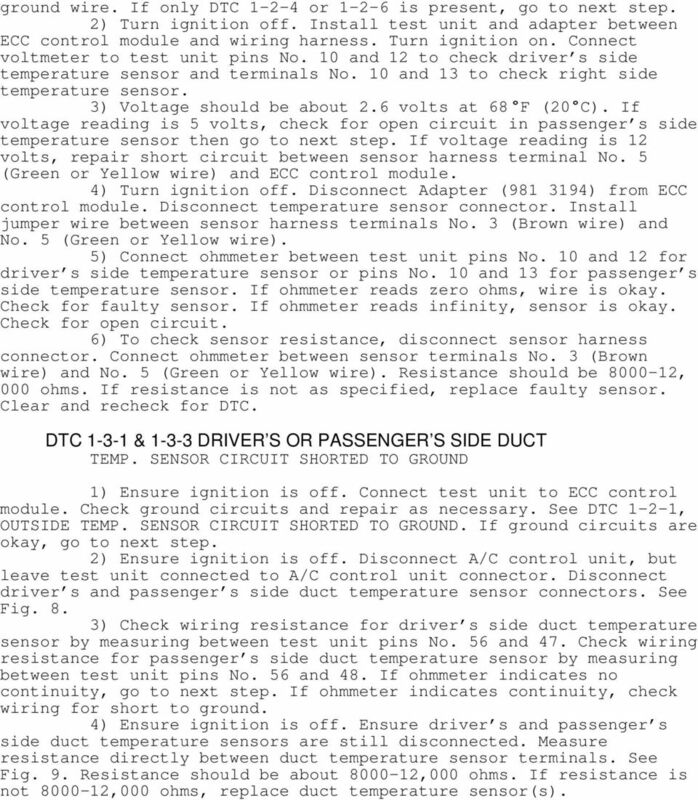 Check wiring resistance for passenger s side duct temperature sensor by measuring between test unit pins No. 56 and 48. If ohmmeter indicates no continuity, go to next step. If ohmmeter indicates continuity, check wiring for short to ground. 4) Ensure ignition is off. 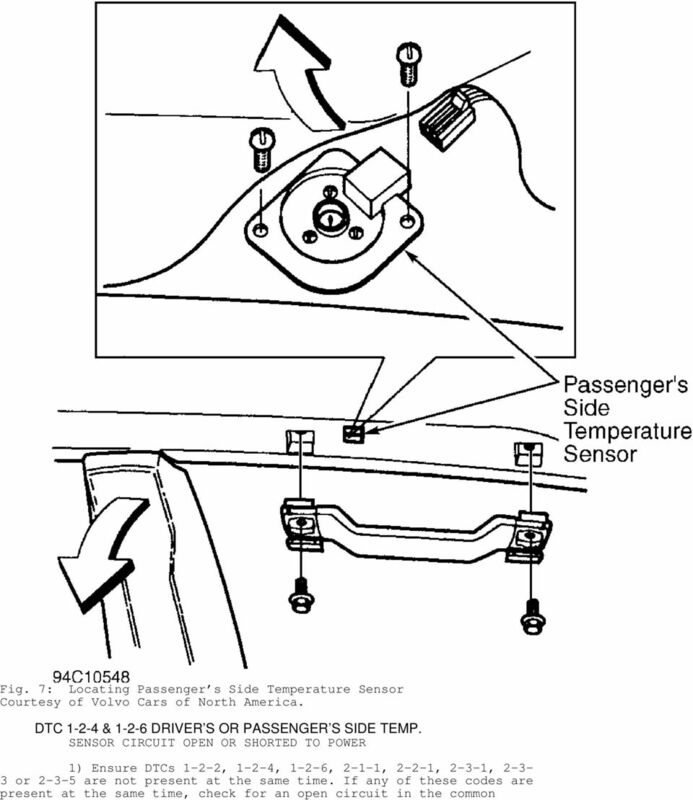 Ensure driver s and passenger s side duct temperature sensors are still disconnected. Measure resistance directly between duct temperature sensor terminals. See Fig. 9. Resistance should be about ,000 ohms. If resistance is not ,000 ohms, replace duct temperature sensor(s). 15 Fig. 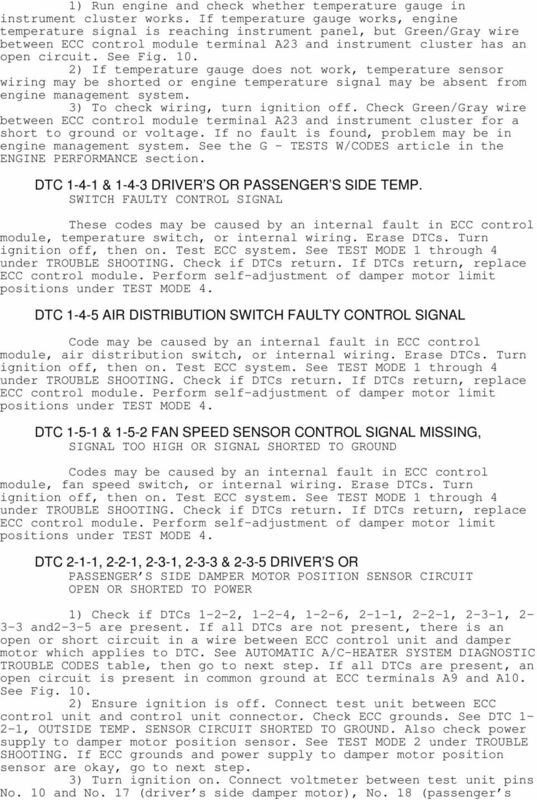 9: Identifying Duct Temperature Sensor Terminals DTC & DRIVER S OR PASSENGER S SIDE DUCT TEMP. SENSOR CIRCUIT OPEN OR SHORTED TO POWER 1) If DTC and are both present, check for open circuit in duct temperature sensor common ground (Brown wire). If DTC and are not both present, there is an open or short circuit in wiring between ECC control module and duct temperature sensor. Go to next step. 2) Ensure ignition is off. Connect test unit between ECC control module and A/C system connector. Check ground circuit and repair as necessary. 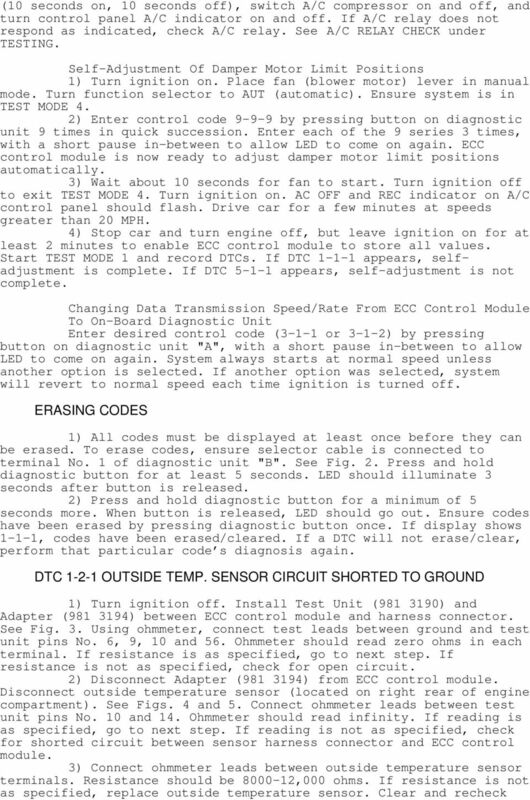 See DTC 1-2-1, OUTSIDE TEMP. SENSOR CIRCUIT SHORTED TO GROUND. If ground circuits are okay, go to next step. 3) Turn ignition on. 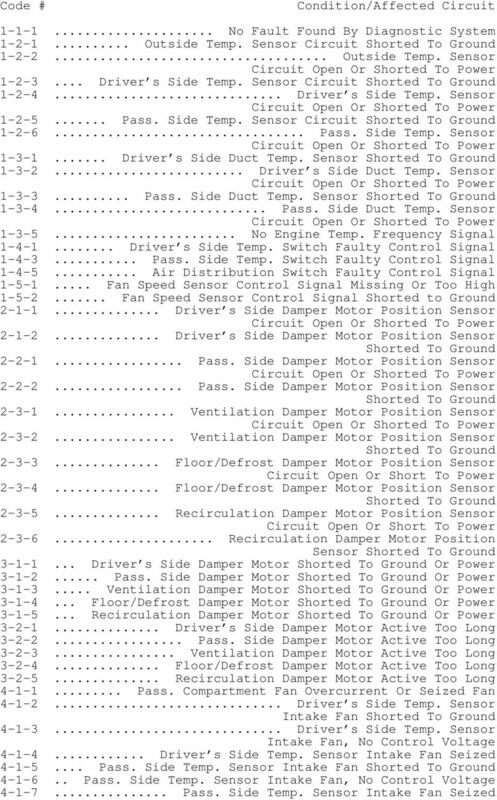 Check driver s side duct temperature sensor wiring by checking voltage between test unit pins No. 56 and 47. 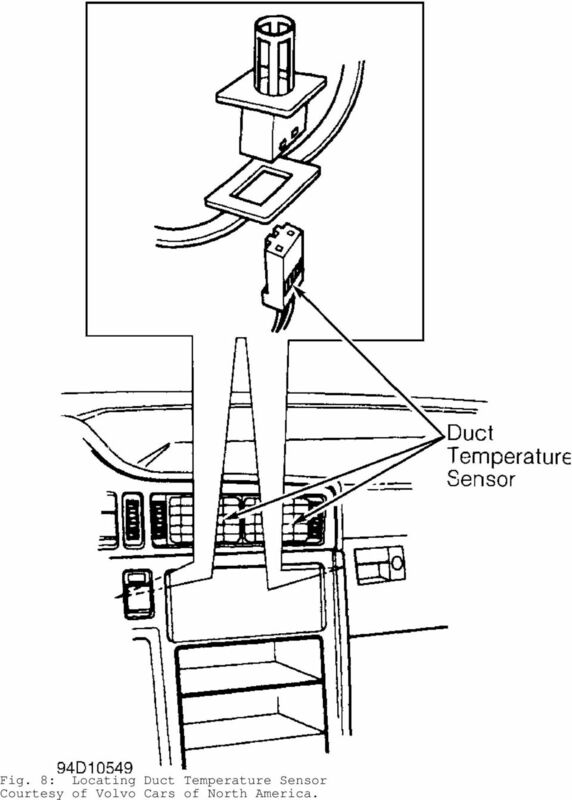 Check passenger s side duct temperature sensor wiring by checking voltage between test unit pins No. 56 and 48. Voltage will vary with duct temperature, but generally should be in 0-3 volt range. 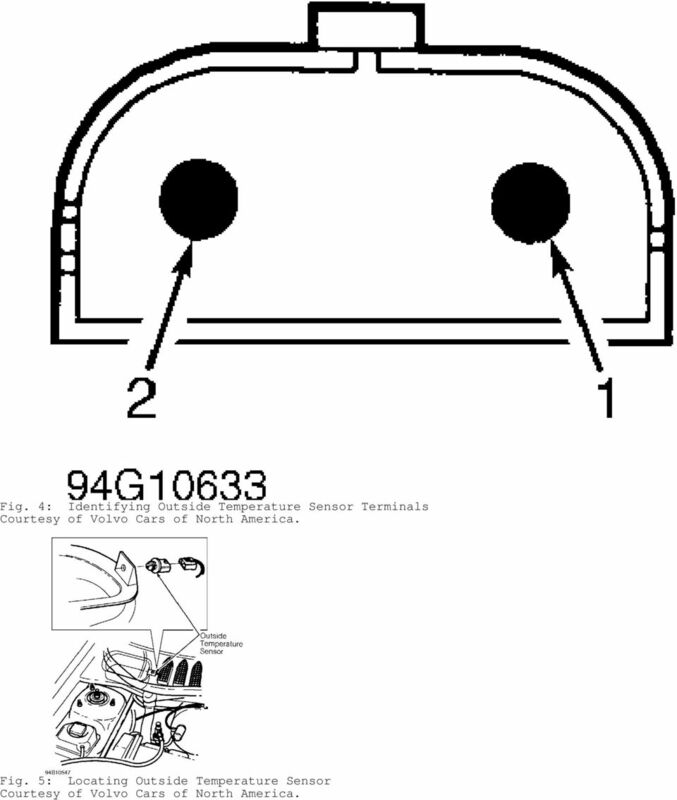 ENGINE COOLING FAN - 2.2L 4-CYL 1994 Toyota Celica 1994 ENGINE COOLING Toyota Engine Cooling Fans Celica 2.2L 4 Cyl ELECTRIC COOLING FAN NOTE: Electric cooling fan may be used for radiator or condenser. HVAC SYSTEM (AUTO A/C) (DIAGNOSTICS) AC Page. Basic Diagnostic Procedure.... General Description...3 3. 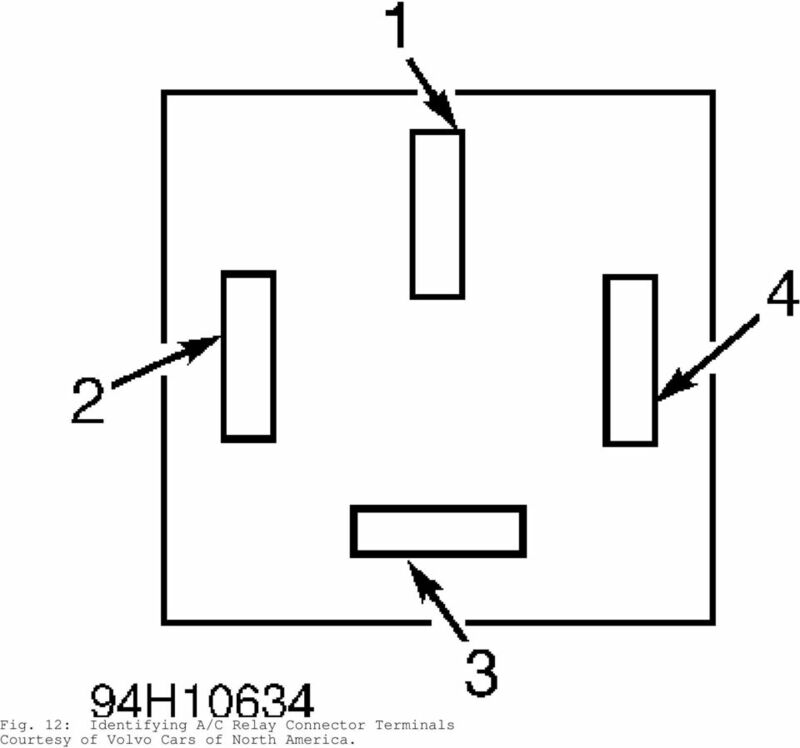 Electrical Components Location...6 4. A/C Control Module I/O Signal...8 5. Self-diagnosis...0 6. V.A.G. Service CLIMAtronic Construction and Function Self-Study Program 135 This document is an UNOFFICIAL translation of: V.A.G. Service CLIMAtronic Konstruction and Funktion Selbststudienprogramm Nr. Service Bulletin SUBJECT: MP4000 Alarm s BULLETIN: C 100 DATE: June 19, 2013 ALARM LIST Where it is possible the alarm number is kept the same as for MP-3000. MP-3000 holds alarm number from 0 to 127.